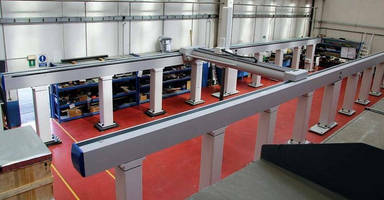 Italian CMM manufacturer COORD3 is a global leader in the supply of large Gantry Coordinate Measuring Machines (CMMs). COORD3 also supplies other leading CMM manufacturers with its large CMM structures that achieve best-in-class dynamics and metrology performance. Recently, COORD3 delivered a massive gantry-style CMM, to a major CMM OEM to be used in the production of aircraft structural components. This special gantry CMM has a measuring volume of 20m (65.6 ft) x 5m (16.4ft) x 3m (9.8 ft) and is the largest CMM COORD3 has supplied to date. COORD3 is one of the very few CMM manufacturers capable of manufacturing very large gantry-style CMM machines used for measuring large sophisticated parts to just a few microns. In 2012 they supplied a record number of gantry CMMs including one equipped with the Renishaw REVO 5-axis scanning technology allowing accurate and rapid measurements to be performed significantly faster than with traditional fixed head scanning CMM machines. Coord3 Industries, based in Torino Italy, is an ISO 9001:2000 certified CMM manufacturer with operations in the USA, China and India. T-Slot Covers facilitate swarf removal.